The rich have a number of things going for them to hit a ripe old age. Here’s a news flash that isn’t really new: the rich live longer than everyone else. Now, on the surface, this seems like a no-brainer. The ability to afford the best of everything should translate into better health while the inability to pay for even basic care, not to mention preventative medicine, is going to cut a person’s life short. For the threshold of the average human life span to surpass say 100 years, everyone should live like the rich do. The upper class has access to better resources, such as quality food and health care. They are also more informed, have the best education and have access to more opportunities. As a result, all of these factors collectively contribute to an improved quality of life. And if infomercials for juicers have taught us anything it’s that a better quality of life extends longevity. But the proof is in the pudding…and that pudding better be full of statistics to back up this kind of claim. Education — It’s been known for some time that educated people live longer than people who lack an education, up to 9% longer. It’s speculated that perhaps the educated assess risk better, make wiser decisions, or just live healthier because they know what’s good for them. Or perhaps the cells in the bodies of the less educated age faster, as one study suggests, due to a lifestyle that includes more smoking and less exercise or lifetimes that include more stress leading to disease. But a recent study showed that, when it comes to cardiovascular health, not only do the educated have lower blood pressure than those who did not finish high school, it was even lower for people with Master’s degrees and doctorates. Now having an education or an advanced degree doesn’t automatically translate into becoming part of the 1%, as we know from a list of billionaires, which consisted of 20% college dropouts or those who never even started college. But higher education has intangibles like being called “doctor” and doctors tend to live longer too. Intelligence — One of the traits among billionaires is their parents have a high aptitude for math. And even in a case of hereditary wealth, being smart enough not to blow through your parent’s entire inheritance is likely one of the factors that the Darwin Awards keeps an eye out for. But it seems that the biological basis for intelligence may be helpful for longevity as well. For instances, researchers using honeybees to model human learning found that the bees that were the best at learning were also able to survive the longest in high oxygen environments, which promotes the oxidation known to cause aging. It’s speculated that the more fit honeybees must have a more robust antioxidant system that helps them endure stress and that this same system is underlying their higher intelligence. Social Status — Social isolation is known to decrease longevity (that’s right, family and friends help extend your lifetime), but what about fame? You’d think that just being nominated for a Nobel prize would be awesome, but it turns out that winning makes all the difference when it comes to longevity. An analysis of physics and chemistry Nobel prize nominees between 1901 and 1950 found that the winners actually lived about 2 years longer than those who did not win. It was speculated that the social status bump from winning is tied to the increased lifespan as the trend is also seen in Hollywood among Oscar winners, who on average live 4 years longer than other nominees. These studies beg the question, who receives more recognition in society for successes, the rich or the poor? Hormones — A 2008 study from the English Longitudinal Study if Ageing surveyed the older population along a variety of health and wealth factors. Buried in the wealth of data they acquired were some interesting correlations between income levels and hormone levels in the body. A hormone produced by the brain called dehydroepiandrosterone sulfate (DHEAS) is important in memory, enhancing the immune system, and a host of “anti-” effects (such as diabetes, obesity, and cancer). While DHEAS is known to decrease significantly over the course of a person’s life, the study found that the highest levels were measured in rich people. Additionally, insulin-like growth factor I, which plays important metabolic roles and serves as a monitor of physical activity levels, was highest in the wealthiest group tested. As with many of the biological processes involving hormones, there’s no way to determine whether increased hormone levels are promoting a certain wealthy lifestyle or whether higher incomes tend to increase these hormone production, but clearly their income is correlating with enhanced physiological processes that promote longevity among the rich. Safety — A 2005 article in the Review of Economics and Statistics found that though disasters hit both rich and poor nations, richer nations experience less death due to disasters, attributing the ability of the institutions and government in richer nations to shield the population during the crisis. In the US, the failure to protect the poor during Hurricane Katrina was one of the biggest criticisms the Bush administration faced. And of course there’s the neighbors that the rich keep. A Baltimore study found that people in the wealthiest suburbs lived 20 years longer than those in impoverished neighborhoods. Activity — In a traditional blue collar/white collar world, it used to be that physical activity decreased as income increased, but times are changing. With decreasing number of physical labor jobs, physical activity is decreasing. In the past, jobs that had high levels of physical activity tended to be the lowest earning, so the low income segment was at least reaping some benefits of exercise to longevity, but not any more. Recent Gallup findings show that the richest people exercise the most and the benefits of exercise are reflected in your DNA. Eat, Drink and Be Merry — The rich eat better, according to a study conducted last fall, primarily because they can afford food that meets the nutritional guidelines of the food pyramid. Here are some more things that studies have shown make people live longer: smiling, as you can see in this TED talk and happiness in general. This begs the question, are rich people happier? A 2006 General Social Survey says yes. Even the month of birth affects health with spring babies having more health problems, which possibly may correlate with why more billionaires are born in the fall. And while people of all incomes can party hard, the rich clearly can afford better health care to keep themselves going, as the 2010 Gallup-Healthways Well-Being study showed with the wealthiest people having a clear well-being advantage. 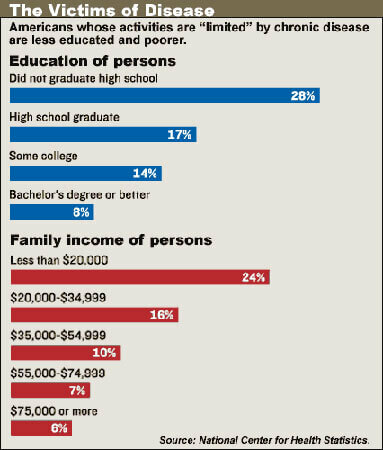 The education and income trends show who is healthier too (from Forbes). And the list can go on and on. Now when you add all of these things up, you can see how these could work together synergistically to extend the longevity of the rich. And not only are they living longer, but the lives that they do live are better because of these factors. Currently, income inequality is getting everyone’s attention because it taps into a very primal drive of ALL humans: survival. But focusing on money alone has convoluted the problem, as it seems that it’s about denying the rich. 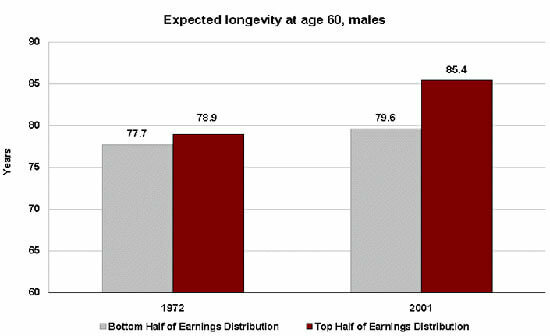 Instead, framing the problem as a longevity gap helps everyone — not just the 99% — understand what is at stake. It isn’t that the masses want to take the money from the rich and give it to everyone. The issue is simply that the benefits that the 1% experience that translates into a long lifetime should be attainable by all. It’s utopian, for sure, but it truly is what everybody wants, rich or poor.